Sometimes a pen is more than a pen. The Shachihata Artline Blox is of course a pen, first and foremost, but with the addition of Lego-style attachments to the barrel, this pen is a great desk toy as well. I'm a fidgeter by nature, and sometimes that doesn't bode well for the pens around me. Constant knock clicking, twirling, tapping are all things I do frequently, especially when stuck on a call at work. The Artline Blox lets me attach the pen bodies and caps together for even more mindless fun! The only catch is you need more than one to really build up the pen connections. When it comes time to stop playing and start writing, the Blox does an excellent job as well. The felt tip reminds me of the Stabilo Point 88 in line width and colors, although you will pay more than twice as much for the Artline. Is it worth it? From a purely writing perspective, no. From a fun perspective? You be the judge. I grabbed the black, orange, and light blue models from JetPens and have enjoyed them laying around the desk. Even if I am using other pens, the Blox hang out nearby for me to play around with. I may have to add a few more colors to the mix so I can complete a six pen circle of life! 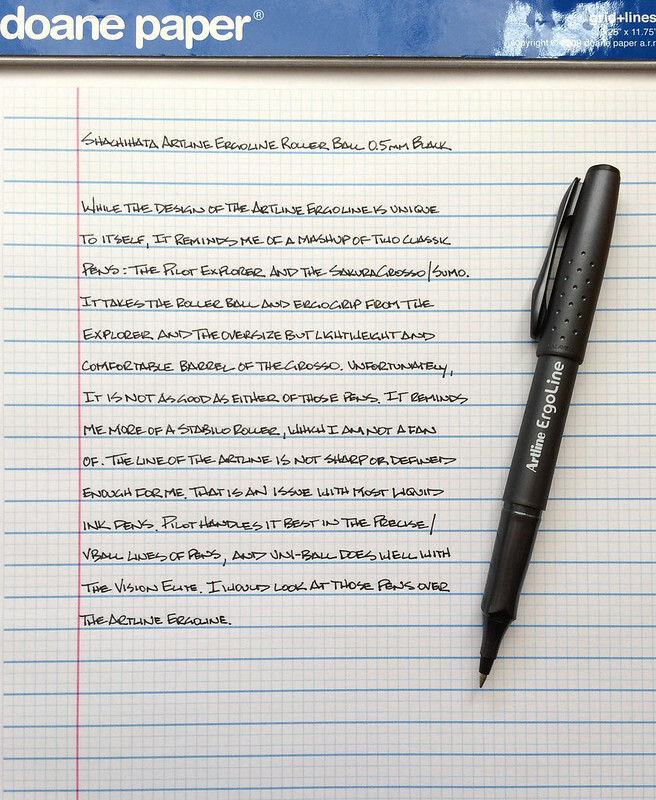 Posted on September 14, 2015 by Brad Dowdy and filed under Drawing Pen, Pen Reviews, Shachihata. The Shachihata Artline Ergoline Roller Ball is a good pen. It's not a great pen. It's not a bad pen. It's a good pen. Many roller ball pens fall into this category for me. I'm not going to reach for it and use it all day every day, but when I do I know it is going to work well. In the written review I liken this pen to two pens I have enjoyed in the past: The Sakura Grosso/Sumo and the Pilot Explorer. The larger barrel size is nearly identical in size and weight to the Grosso, which is lighter than you would expect by looking at it in the pictures. The molded grip is close to the Pilot Explorer. While some people may not like that, for those that do it is comfortable to hold. It's like a perfect mashup between these two pen. When ink hits the page the Artline Ergoline is not as good as the best roller ball ink pens, such as most anything from Pilot or Uni-ball. The line is not as sharp or defined as I would like. It performs more like a Stabilo roller ball if you have used any of thier products before. Side by side there is a difference between the Shachihata and the big boys, which keeps this pen in the good range rather than great. 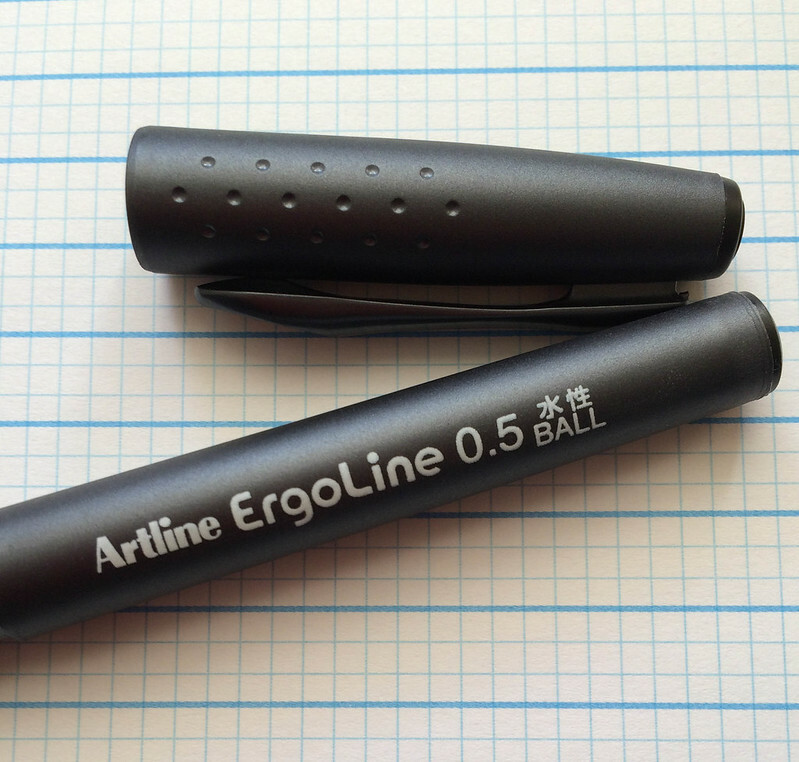 If you are happy with your current roller ball pen the Artline Ergoline is not likely to trump it. 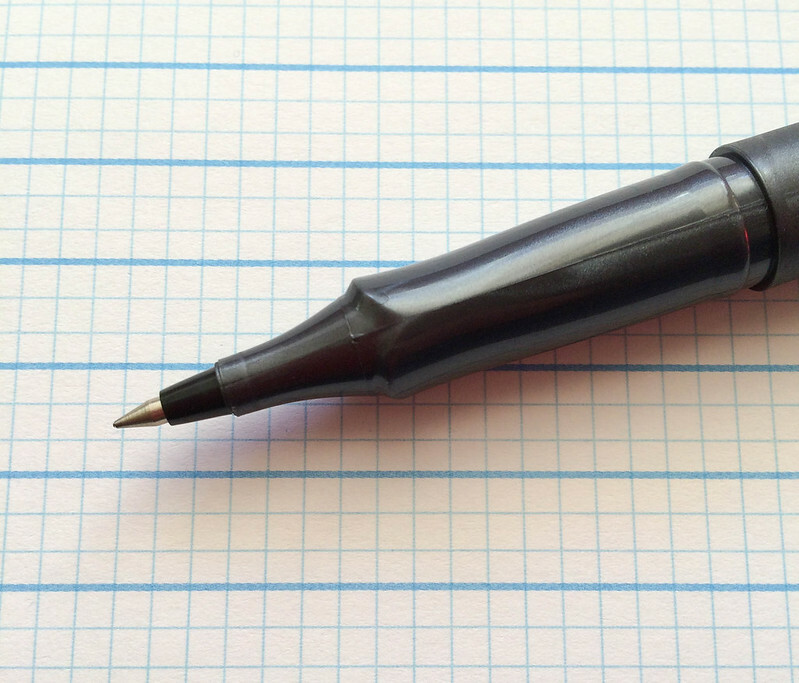 But if you find that a slightly larger pen works better in your hands it is worth checking out. Posted on December 12, 2013 by Brad Dowdy and filed under Pen Reviews, Shachihata.